Carrot & Shallot Soup – o frabjous day! When I make soup, I generally make them as chunky and thick as possible, so this attempt to make a clear, fragrant soup was quite new to me. I began by gently frying finely chopped shallots with a little bit of olive oil in a large saucepan. I added two finely sliced garlic cloves, salt and pepper, and stirred for a little while. I then poured in several peeled and finely diced carrots. 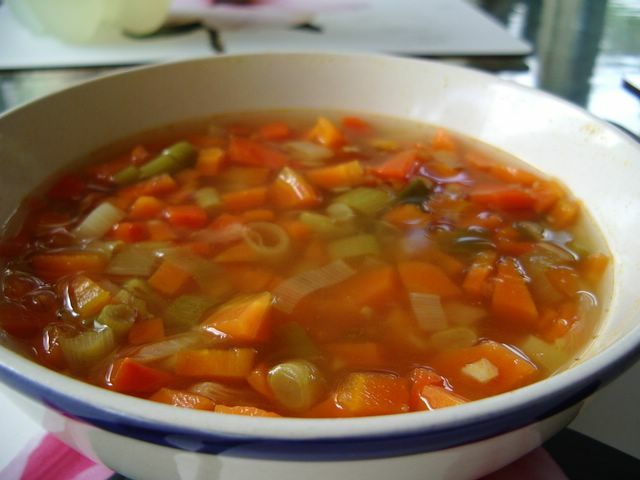 I didn’t have any excellent stock in the fridge, but if you have homemade or liquid stock, I suggest you use that – pour in a generous amount to cover the vegetables. I used a powdered chicken stock (as I’d run out of vegetable), and it turned out very well. In hindsight, I don’t think I put quite enough water in – some bowls were very chunky with carrot, and that wasn’t quite the effect I was going for. I wanted a fragrant liquid with scattered pieces of carrot and shallot floating in it, not piles of carrot with a bit of liquid on top. Then again, I suppose it’s better to be less generous than too generous with water – it’s easy enough to add more liquid to a soup, and rather more difficult to reduce it. I’d like to try this again with better stock and some different vegetable combinations – I’ll have to resist throwing too many things in, and ending up with a chunky soup yet again.